I am not a golfer (at least not since I gave my father concussion when he was teaching me how to hold a club age 9) but, if I were, this is where I would want to play golf. It may only be a nine hole course but what it lacks in holes, it more than makes up for in location and views. There can’t be many places in the world where you can play golf in such stunning surroundings surrounded by scenery like this (and I took this yesterday on my phone so it is actually even more stunning in reality). 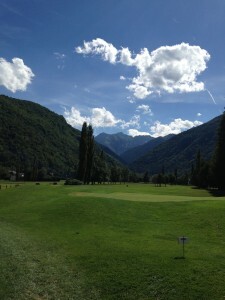 The mountain is the Vénasque in the Pyrénées and the golf course is in Bagnères de Luchon which is about as far south as you can go in France before hitting Spain. Luchon also boasts a small airfield, tennis courts, two swimming pools, thermal baths and spa, fantastic walking and cycling trails, a ski resort, numerous restaurants and shops, a cinema and a train station with trains to Toulouse and Paris. If moving to France is all about a quality of life decision then I can’t think of a better town to choose to be close to than Bagnères de Luchon. What’s more, prices here are still reasonable compared to any equivalent town I know. Having said that, it is very noticeable that in the last few years Luchon has started to attract a younger and wealthier crowd and there is a huge amount of investment happening in and around the town so I have a feeling that the rest of the world has also started to discover the delights of Luchon.